Boulder, CO • November 12, 2013—The American Homebrewers Association (AHA)—the not-for-profit trade association serving as a resource and community for homebrewers—released results of a first-ever nationwide homebrewer survey today, a break-down of demographics, brewing habits and shopping behaviors of American homebrewers. According to the survey, there are an estimated 1.2 million homebrewers in the United States, two-thirds of whom began brewing in 2005 or later. Demographics: The average homebrewer is 40 years old, with most (60 percent) falling between 30 and 49 years old. The majority of homebrewers are married or in a domestic partnership (78 percent), have a college degree or some form of higher education (69 percent), and are highly affluent-nearly 60 percent of all homebrewers have household incomes of $75,000 or more. Production: In terms of brew production, homebrewers mainly stick to beer—60 percent of respondents only brew beer at home, compared to wine, mead or cider. AHA members and people affiliated with the AHA on average brewed nearly 10 batches of beer per year, at 7 gallons a batch, which is 15 percent more batches and nearly 30 percent more volume than homebrewers who were not affiliated with the AHA. Collectively, homebrewers produce more than 2 million barrels of brew a year, which represents a small but sizeable portion (1 percent) of total U.S. production. Retail: Nearly all homebrewers (95 percent) shop in two local homebrew stores eight or nine times a year, while a majority (80 percent) also shops in three online stores five times a year. On average, homebrewers spend $800 a year—about $460 on general supplies and ingredients, and $330 on major equipment. The survey was completed by more than 18,000 homebrewers via an online survey from July 30 to September 3, 2013. Of the respondents, 65 percent were members of the AHA, and 35 percent were unaffiliated homebrewers. 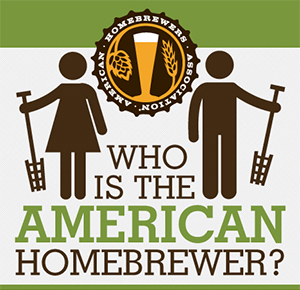 The American Homebrewers Association has worked on behalf of the homebrewing community since 1978 and celebrates a membership of more than 40,000 homebrewers. The American Homebrewers Association (AHA) organizes events including the National Homebrewers Conference and National Homebrew Competition. The AHA also publishes Zymurgy magazine. The AHA is part of the Brewers Association, whose Brewers Publications division is the largest publisher of contemporary and relevant brewing literature for today’s craft brewers and homebrewers. Beer lovers are invited to learn more about the dynamic world of craft beer at CraftBeer.com. Follow the AHA on Twitter, and join us on Facebook.